Seven members of the No. 1 Oklahoma women's gymnastics team earned a total of 10 regular season All-America honors from the National Association of Collegiate Gymnastics Coaches/Women (NACGC/W). 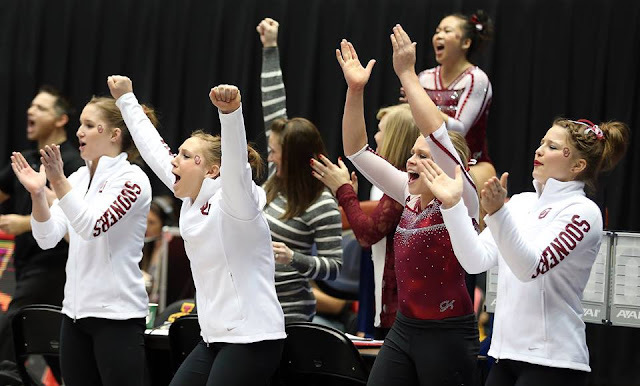 The Sooners' 10 awards stand as the second-most nationally, and their four bars honors matches the most in the nation on any event (three first-team accolades on the event are the most named to the first team). In the four years that regular season All-America accolades have been awarded, Oklahoma has totaled double-digit honors three times. Regular season All-America honors are based on an individual's final regional qualifying score (RQS) prior to regional competition. First team honorees are ranked 1-8 nationally, and second team designees are ranked 9-16. Junior Chayse Capps led all Sooners with three first-team honors in the all-around and on bars and beam. Capps, the Co-Big 12 Gymnast of the year, has now earned beam recognition in each of her seasons as a Sooner (second team 2014, first team 2015). This season marks the first that Capps has competed on bars and in the all-around. Also securing multiple awards was senior Keeley Kmieciak, who captured honors in the all-around (second team) and on bars (first team). The Naperville, Ill., native now has three regular-season All-America honors to her name, also earning an award on bars (second team) as a freshman. Joining Capps and Kmieciak in receiving recognition on bars were junior McKenzie Wofford (first team) and true freshman Nicole Lehrmann (second team). The award was the second consecutive for Wofford, who is currently tied for No. 1 nationally on the apparatus. Senior Haley Scaman earned first-team honors on floor. In her career, Scaman totaled six regular season All-America honors (all first team), including a floor award in each of her four seasons. Sophomore AJ Jackson picked up her second regular season accolade as she was named to the first team on vault (second-team floor in 2015), while sophomore Natalie Brown earned her first career honor, doing so on beam (first team). The No. 1 overall seed Sooners will next compete at the NCAA Iowa City Regional, where they will face No. 12 Nebraska, No. 13 Arkansas, Iowa, Kent St. and Central Michigan on Saturday, April 2. The regional is set to begin at 4 p.m. CT inside Carver-Hawkeye Arena, and tickets are available for purchase online.